The ANC2018 Organising Committee is delighted to bring you the ANC2018 Program. As you may know, the Conference theme is ‘Partners in Practice‘ and the Program has exactly that. 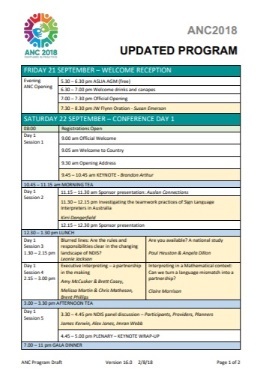 We hope that over 3 days – Friday 21st to Sunday 23rd September – will nurture, provoke, recharge and validate your role as an Auslan practitioner or as an aspirant interpreter learner.